In the 19th century the Balkan Peninsula was the powder barrel of Europe, the region where nearly all the wars started. Then in the 20th century, Russian and German ambitions made Eastern Europe the powder barrel. Besides the Middle East, the 21st century seems to have its own soft spot: the Caucasus region. Here an explosive mixture of dictatorship, military ambitions, Islamic fundamentalism and battles over rich natural resources are threatening Europe's stability. Most recently in the Caucasus, the Russian-Georgian war of 2008 left the region in tatters. Consequently, Georgia has seen its chances to join NATO or the European Union in the foreseeable future disappear. The Georgian army was crushed by a rudimentary Russian force, proving that Georgia is far from holding a position of strength in the region. 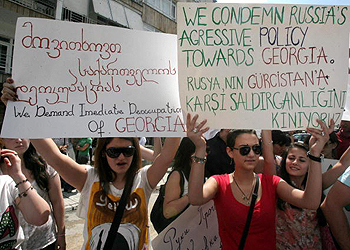 Georgia has also seen amputation of its territory by the independence proclamation of South Ossetia and Abkhazia. Both newly created countries are supported militarily and economically by Russia, which is making any transgression against these two countries a casus belli. If Georgia does not relinquish its claims to these two regions, it will never be accepted to NATO or the European Union, as both organizations require a prior settlement of frontiers as a part of any pre-joining negotiation. Now an isolated Georgia, a war-ravaged country confronted with street demonstration and an unpopular president with authoritarian tendencies, is ready to engage in a political war with Russia. In August, tension broke out between Russia and Georgia, both trying to win a P.R. confrontation. The politics suggests that the two countries are prepared to continue their confrontation. The Georgian-Russian war is not the only conflict that is casting a shadow over the region's prospects of development. The north of the Caucasus seems to be once more engulfed in the flames of radical Islam. In 1999, then Prime Minister Putin built his career on crushing the Chechen rebellion. Ten years later the story is again on the front page of newspapers: Chechnya is burning. In Ingushetia, the neighboring republic of Chechnya has seen in the last months its president badly wounded, two ministers assassinated and a radical increase in terrorist activity. Stirring the old wounds of Chechnya, the Kremlin prodigy Ramzan Kadyrov is confronted with an Islamic revival, assassinations and attacks that plague the country. The prime minister even called upon Vladimir Putin in a desperate effort to prevent a new war in Chechnya that could be fatal to his political stature, cognizant that Chechnya war destroyed Boris Yeltsin's popularity and toppled two Russians prime ministers. The conflict has spilled into Dagestan and North Ossetia, menacing the pro-Russian leaders and the stability of a difficult region. A new war in the Caucasus with a Russian unreformed army, in a crumbling economy, could spell disaster for Russian imperial ambitions. Azerbaijan is not enjoying a comfortable position with regards to power struggle in the Caucasus. With a large Shia population (the same as in Iran), Azerbaijan has cause to be worried about Iran becoming more isolated. If a war breaks out in the region, Azerbaijan is crucial. Its air space must be used for aerial attacks on targets in Iran, the country radar system must be used to control Iranian air space and any missile interception system to prevent attacks on Europe and Israel must be positioned there. Israeli President Shimon Peres made a landmark visit to Azerbaijan in June to reaffirm the strategic relationship between the two countries. Azerbaijan shares with Iran a long border, an important Shia population and a common history. Iran is experiencing crucial internal issues—economic crisis and endemic corruption—that make the country fragile. Because of the links between the two countries, an attack on Iran could be fatal for Azerbaijan in the present diplomatic and economic construction. As if the geopolitical confrontation in the region were not enough, the resources battle is at a pitch as well. The oil and gas resources of the Caspia Sea are pouring through this region either to Russia or to Europe. Also, the wealth of Iran in gas and oil can be exported to Europe only through this region. Russia is trying to secure its control on energy routes in the Caucasus by building a South Stream pipeline, dismantling independent pipelines and exploiting the military victory over Georgia as leverage in controlling the region's resources. The European Union is trying to find alternative routes and reserves of gasses, bypassing Russia, by building Nabucco. But the Nabucco pipeline must go through the Caucasus region, and the gas and oil reserves are also in the region. The Caucasus is fragile, with authoritarian regimes, economic corruption and an ongoing battle for influence and power between Russia, the United States, the European Union, Israel and Iran. The future of the region may be even cloudier than it seems, with potential to be the new powder barrel of Europe. Anton Caragea is a professor of international relations and political science, and director of the Institute for Research on International Relations and Political Science in Romania.